On my Third day...no nausea taking one Vitacost quercitin 700 mg / Vitamin C 250 mg twice a day. Once in the morning , once at night always with a little food in my stomach before taking. Unfortunately not seeing any noticeable results as of yet. I have a very large nodular BCC and two smaller problem BCC's..a lot of AK damage. Things may be happening but I am going to just continue on for at least 30 days and see if things see actual improvement / shrinkage. Based on Jims reports I bit the bullet and ordered two bottles..a total of 360 capsules so I could use this for another 6 months at 2 capsules a day if I think it merits supplementing with this. I don't want to clutter up this thread with a bunch of daily updates so I will hold off reporting back on this for at least a few more weeks unless something very significant happens prior to that. I am using both Green Tea Extract and the Q&C. May I suggest you brew some Lipton Green Tea with about 3 tea bags. I also am going to go to 2 times per day. Can you inform me about the results more often? I have sent you my email address. I just have to know if this thing works. Do you still see more improvement? Yes I am seeing improvement BCCs still getting lower in height. Approaching flatness but not disappearing yet. Hope they will when totally flat. Remember these things were here for years so they really do not want to go away. Using 2 treatments per day now. Missed one of them yesterday but will continue them. Anivoc, I tried to reach you after you sent me a message but I can't seem to reach you. Can you send me a message here? Has anyone else tried this treatment protocol? Please post your results here! JimB, how are you now? Actually I am doing excellent. I am taking one Vitacost Quercitin 250 mg / Vitamin C 700 mg capsule and one Vitacost Green Tea Extract 500 mg capsule twice a day now. I take them at the same time. It does have to be in your system all day or you feel as if progress is slipping back by the end of the day. If results continue as I expect and cancers are cured I will take the tablets once a day for life as I would expect that internally it would prevent growths of misc cancers. I do not have any symptoms with the mixture now as I first did. But on an empty stomach or low hydration I still feel a rush type effect when I first take them. I have experienced improvement everyday taking the pills. The daily improvements are something only I can see or feel because it is minor but after awhile it all adds up. As you can see from the picture in a previous post I had 3 Bcc's next to each other. Earlier this week all 3 swelled to the point of being annoying. But then at night all 3 collapsed leaving a partially empty callous type skin which can be shaved off. I've seen this before with topical treatments, it is the death throw of the BCC. So all three went flat. Now one has raised its head again but I have no doubt it will be killed also. It is just tougher than the other 2. My blotchy red skin is disappearing slowly. Also my SCC seems to be retreating slowly and healng. I will take a picture tomorrow and add it here. With your help I can inform more cancer patients about this cancer treatment protocol. Here is a 2 week picture to show the difference. Yesterday after my post the remaining BCC collapsed again and I shaved more callous type skin off with no bleeding as the skin is significantly above the shrinking BCC. It is still there. This is probably the 3rd time this one has collapsed. Once with topical treatment and 2 times with internal treatment. This one is stubborn but probably there for more years than I care to think about. I have no problem with you quoting me and referencing this forum. I believe more progress is ahead but I cannot guarantee it. Not everything on my face is cancer so I do not how much will vanish under this method. My goal is to get rid of the BCCs and SCC on my face then I will sort out what remains. And I am not responsible for other people's side effects if they on their own try this procedure as I am not recommending it to anyone only recording results for my own future use. It is very helpful to record your actions in a log, as you can refer back to them if you want to try it again. Ok I hope that the third BCC will disappear over time. I am also curious about if others will have the same results. If that is so that would be very exciting. And if not it's time to find out why. I actually predicted that all cancers would disappear with this Quercetin + Vitamin C mix because it simply kills all the cancer cells and leaves all the healthy cells alive. Also, this mix is absolutely great because in theory it would penetrate everything (I call it super-bioavailable). Your results "prove" that I was right. But when I said with your help I can inform more cancer patients I actually meant this: I spent alot of time and money on my website. And ofcourse I would do that after finding something that could be a "cancer cure". I am looking for people who can support me. I am just asking you to think about it. With support I can buy more advertisements to make my website more popular. On the long term, other cancer patients can see my website as well and try the treatment protocol using quercetin + vitamin c.
A google of the Quercitin Advocacy Group ( listed as the owner of your site) shows that group has been banned and post removed from other forums for trying to get "donations" You are treading that same path here and that needs to stop now. Dan built this site 12 years ago and has supported this site solely out of his own pocket not asking for a penny from any of us ever. He makes no money off of this site though I am sure he has plenty of opportunity to have advertising. He has done all of this out of the goodness of his heart and to give glory to God...all to help people in their battle against a very frustrating, disfiguring and sometimes deadly disease. I have allowed you to post links to your site here because I believe it is relevant. From here on please refrain from asking for financial support of your website or research on this site. We are all here to beat skin cancer not to make a living at it. Not trying to insult you or chase you away if you want to contribute viable relevant information to the quest here. Quercetin + vitamin C needs free radicals to kill cancer cells and maybe the EGCG provides these free radicals. Anivoc, are you going to try to add the green tea (extract)? I have read that self-brewed green tea has a good amount of EGCG in it. So called "ready to drink" green tea only has very low levels of EGCG. I really hope that with EGCG the mix will work. There are about 150 mg of green tea flavonoids per tea bag, I believe that not all are EGCG. The green tea extract is 500 mg per capsule 50% EGCG. By the way things are still improving. BCC getting real small but not gone yet, almost. SCC is starting to heal up well. Redness on face clearing also. Scroll down to page 97. Thanks for the link Steve...The Teas actually start on page 98 and go through to page 103....Interesting point is that most teas have quercitin as one of the flavinols in them.. I have not yet started the green tea just using the quercitin with no noticeable changes happening on my VERY LARGE BCC's... that said, I have quite a bit of green tea in my possession fresh from China so I think it is time to add it to the regimine. I will post back in a week or so and update if I think there is a difference...fingers crossed. Jim which brand of green tea extract are you taking? Are you taking the green tea extract together with the quercetin + vitamin c? I ask this because vitamin c can increase the absorption of EGCG. I am taking one Vitacost Quercitin 250 mg / Vitamin C 700 mg capsule and one Vitacost Green Tea Extract 500 mg capsule twice a day now. I take them at the same time. Can you give me your email address? I can't send you any emails because your profile does not have the personal contact button. If you don't want to place your email address here in public please go to my forum and send an email to me. I still can't contact you. Your email address does not seem to work. Strangely anivoc hasn't produced any good results (yet). Jim said that there are still some tumors left. I thought that the possible reason may be that EGCG isn't a very good pro-oxidant after all. It's not known if all the EGCG generates free radicals as it only generates free radicals (in the form of H2O2) under specific conditions. And it also isn't known exactly how much free radicals it generates. So maybe you should use H2O2 instead of EGCG. H2O2 oxidizes quercetin + vitamin c immediately. Rub your skin with quercetin + vitamin c. Add 1 mL of 3% H2O2, rub it well. Add a littlebit of water, rub it well. Add a littlebit of water again and rub (repeat adding water and rubbing if necessary). Afterwards wash it off with water. Ofcourse you can also take it orally, the instructions for that are found on my website. "There was >3.5-fold increase in the average maximum plasma concentration of free epigallocatechin gallate when Polyphenon E was taken in the fasting condition than when taken with food." I do believe that the strength of the capsules is related to whether you have eaten or not. From my own experience I have seen better daily results when I took my second pill before bed. So now I take one pair of pills at 10am and 1 pair at 10pm. I really prefer to eat as soon as I get up. So to me this is a good alternative. As far as progress goes, it is slower. The BCC that I referred to in the above pictures is about .5mm in height now. This is significantly smaller. I would say when the treatment started the BCC was 2.5mm in height. There were 2 others that completely disappeared under the treatment earlier. The creme that I refer to is discussed elsewhere in the forum. My idea was to see how it worked with the internal treatment. It has cleaned up some of the red areas on my face and misc spots. Also the BCC without the Sunspot ES use to swell or shrink at various times during the day or day to day. Now the BCC does not swell just stays small. I will try to take a picture sometime this weekend. I am interested in the H2O2 comments above and will take it under advisement but for now I want to try this. If anybody else has tried quercetin + vitamin c (+ H2O2) please post here. The green tea at 10 pm forced me to see the sun rise 3 days in a row. What do you mean by that. Do you mean you couldn't sleep for 3 days in a row? How much Quercetin, vitamin C and EGCG did you take? If you took vitacost green tea extract you probably took 250 mg EGCG. Is that right, did you take 250 mg EGCG? Did you take them all together? Do you take vitamin c as well, that is important, but you didn't mentioned it in your post. It might be that the combination has some kind of effect on the brain so it causes difficulty to sleep. However, I never heard about this side effect before. Yes limiting the caffeine intake might help but I am not sure if it's the caffeine that caused it. Maybe you should take melatonin to help with sleeping. I have no problems falling asleep and take one set of capsules just before bed. Not related to the capsules, I only get approx 7 hours of sleep usually waking early. Progress has really stopped now and I have one of the three BCCs remaining although smaller in height then when I started. Also I still have an SCC that will not go away. For a couple of days I tried 3 sets of pills per day but did not feel that they had an effect so I went back to two sets of pills. I need to get back to using an aggressive topical mixture but not really motivated yet. JimB and Steven, I have been following your post and have tried your approach, how ever the combination was causing me problems. I modified it slightly - vitacost quercetin and bromelain and decaffeinated green tea extract. I am only on day two but I would like your opinion. The green tea at 10 pm forced me to see the sun rise 3 days in a row. I went to sleep last night w/o a problem but I did eat before the quercetin. JimB's pictures were compelling and I would like to have some of that success. Thanks. Jim, maybe you should try the quercetin + vitamin c + H2O2 used topically as instructed a few posts before this one. I think it could work. When I started using the mixture I also had stomach issues. And developed a cold sore on my lip. I wrote that off to the combo working. Sort of like when you get sick if you workout too hard and the muscle cell wastes are floating around in your system and you get sick. I started with one set of pills per day and then graduated to 2 sets later. Also I had to take some food to make the stomach nausea go away. I have no problems now though. I have no knowledge of bromelain so I can't help you there. In my opinion it's better to use exactly the same brand/ product and dosage as Jim used. But if you can't, then the other brands/ products can be good as well. After all it's (almost) the same ingredients. The bromelain added should not be a problem. But there are small differences between brands, I have noticed for example that twinlab quercetin + vitamin c is less yellow then vitacost quercetin + vitamin c.
The other poster, sick of BCC disappeared strangely. Sick of BCC are you seeing any good results from the quercetin + vitamin c + green tea extract usage? You can also message me privately on my website: http://treatcancerinfo.wix.com/cure if you don't want to put it here. Sick of BCC (he/she posted here several times), what happened, why did your posts disappear? Maybe you need to add Vitamin E (another antioxidant) to this mix. JimB used vitamin e along with this mix, maybe this is why it worked so well. I now advise to dissolve the quercetin + vitamin c in 100% pure orange juice, which can make the quercetin + vitamin c work much better. You can check all the information on my website. I just got another person who responded well to this therapy. This person added Vitamin E to the mix. I thought I read it at his website, but I can not find the reference quickly. I thought he mentioned that the Q&C will work better with EGCG which is found in Green Tea Extract and other natural sources. I had them around because of using them externally with viagra and they work externally but slower than the above method. I did not take the green tea extract internally before by itself so I do not know. Maybe future posters can try it by itself. I have a couple of hundred around its easy to take them. The green tea extract? In a quick review I didn't see Steven suggest that. Is this something you decided to add to the regime or something Steven suggested? I have ordered the quercitin / Vit C and will jump on the guinea pig team as soon as it arrives. So it's actually a bomb. A flavonoid molecule is like a bomb that explodes if it's not removed before a cell tries to divide. Cancer cells that divide before reperation die, because the bomb isn't removed, so it explodes when the cell tries to divide. Normal cells that divide after reperation remove the bomb so they live. Cancer cells that do completely repair their DNA before cell division aren't cancer cells anymore (they are normal cells) because they have to wait a long time before cell division. So flavonoids kill only cancer cells but no normal cells. Cancer cell that completely repairs = normal cell. Have you tried Quercetin + Vitamin C (+ green tea extract)? If the Quercetin + Vitamin C doesn't work then try to dissolve it in 0.5 Liter of water. Shake several times and then take it gradually. This should be much more bioavailable and this kills cancer cells much better. Optionally add green tea extract to the mix (the 0.5 L bottle). You should also add 400+ IU Vitamin E, as that works synergistically with Quercetin + Vitamin C.
I think that vitamin E is the "magic bullet". Add vitamin E to the mix and it will work. All the people who had vitamin E added to the mix had good results! You mention "all the people" who tried it with vitamin E had good results..
Who are "all these people" and do you have a single set of before and after pictures of visual proof? Do you have medical documentation from any of these people that they really had cancer? If you do please post.. I believe your heart is in the right place but cancer can a deadly thing and saying you have a "Cure" when you have a theory is irresponsible. I'm all for giving people hope and trying new approaches but they need to be presented as an experiment not like it is tried and proven system or method that is a 100% "CURE"
I have a testimonial of a person saying that after taking vitamin e + quercetin + vitamin c tumors were falling off and this was accompanied by bleeding. This person saw pieces of dead tumor (his mother has cancer) in the toilet bowl. This is exactly what would be expected, according to my theory. It should kill all cancer cells and wipe out all tumors. And I am using this myself to kill bacteria in my mouth. With success, because I have 2 teeth that should be pulled out by the dentist, but due to the bacteria killing effects of quercetin + vitamin c + vitamin e + fluoride (free radicals), my teeth are still there and they don't hurt anymore even though one tooth has a major hole in it and the other one is loose due to severe gingivitis. The mix completely kills all bacteria, preventing inflammation of the teeth. Bacteria are like cancer cells. The mix also has the ability to penetrate skin like DMSO and it should also penetrate tumors with ease. By the way, where is JimB and what does he say about the treatment protocol? I didn't see him write anything about the treatment protocol, after initially he had good results. I am still looking for more testimonials (good or bad)! Undocumented "testimonies" carry no value. They are deceptive and give false hope to the people who take them as something more than what they really are (hearsay / gossip). 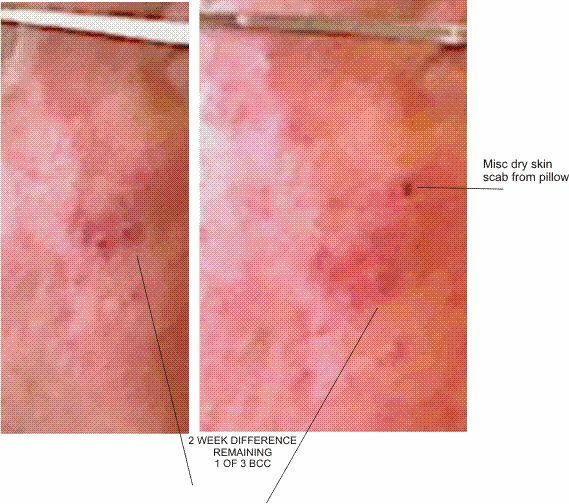 "POIDH" (Pictures or it didn't happen) At the minimum pictures that document the before and after results are required...to add credibility to the pictures, a biopsy prior to treatment is really necessary ( though sometimes the pictures are pretty clear it was a real skin cancer) as without a biopsy prior to the treatment protocol there is no scientifically / medical documented proof what type of skin cancer or lesion it was. This forum is for non melanoma skin cancers...not internal cancers..
Jim B posted in this thread for about 2 months in 2013 and has not posted again in this thread in 3 years...his last two post indicated what he thought was progress had come to a stand still and that he still had the tumors..based upon your enthusiasm I tried both internally and externally and IMO wasted time and money on something that in no way shape or form helped me with eradicating my skin cancers. A lot of people come here seeking help .based upon JimB and my personal experience in trying your protocol, I strongly discourage anyone else from putting any time, energy and money into it as it appears to not have any long term effect and you have provided zero documented proof otherwise. Have you tried to combine Quercetin + Vitamin C + Vitamin E with H2O2 or toothpaste (source of free radicals)?